Home > Self Defence > What Self Defence Options Are Available to Children? Lots of parents send their children to self defence classes, and lots of children ask their parents if they can attend such a class. However, the array of choice can be a little bewildering, especially if, as parent, you have no previous experience of self defence or martial arts. There are many different types of class on offer for children of all ages but knowing which one may suit your child is no easy task – and sending your child to lots of different classes to get a flavour of them is not really practical. What follows is a brief introduction to come of the main types of self defence class for youngsters. One of the best known martial arts to children, thanks in no small part to popular films such as the Karate Kid, karate is an excellent choice of self defence class for a child. Classes will be hard work and physically taxing, helping your child to get fit, and there is also a good amount of self defence to the sport which should stand a child in good stead for unexpected situations. 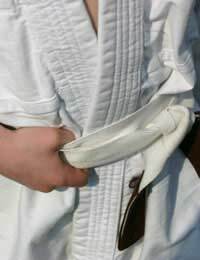 However, if your child is not amenable to the idea of hard work or discipline, it may be better to find an alternative, as the one thing karate does require, even from children at a young age, is discipline. Many people believe that judo is the best self defence sport for children. One of the main advantages of judo is that most work is done with a partner because it is based on throws and hols and not the kicks and punches which karate is formed through. Therefore, to do any judo move a partner is needed. This is usually very acceptable to children as they will, from the very first day, get a ‘buddy’ to train with. However, children who are shy may not like the idea of having to do everything from their first lesson with a partner. While much of the sport of kickboxing is less suitable for children than sports such as karate and judo, many kickboxing schools have taken the sport and created a child-friendly, non-combat version of it especially to appeal to youngsters. In versions of the sport such as this, the children get to learn how to kick against pads and how to move – but crucially, not how to fight. This means that they get all of the exercise and confidence benefits from taking part in such a sport – but without the aggression which naturally goes hand in hand with it. There are also classes on offer for children which are not tied to a specific martial art but are more general in terms of the self defence. These classes will show them how to defend themselves in the face of danger. The skills they will learn here are more practical and perhaps, if your child has to walk to and from school alone, this is a good idea. But the downside to this type of class is that it is a pure self defence class. If your child is keen to take up a sport in which they can compete and possibly win titles and medals, then one of the classes outlined above may be a better bet. Whichever self defence option you choose for your child will be a good idea for all of the reasons listed above and many more. Self defence in any form will always equip a child with higher levels of self esteem and confidence – both key attributes for life, just as much as keeping fit and healthy.